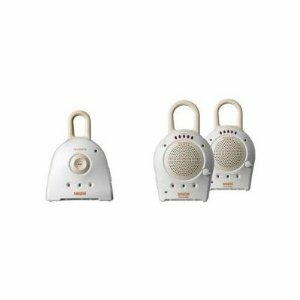 This baby monitor offers clear sound and it very durable. This monitor has been with us for 3 years already and we love it. It has a long range and very little interference. This monitor has been good for us. We take it all over the house, even out on the back porch and don't get any interference. It it so small and light that we even throw it in the overnight bag to take to grandma's or on vacation. Works fine. Love the voice-activated feature although it could be better. When I turn on the space heater in my kids' room, it activates the monitor also. I wish it really were voice activated. Another annoying thing is that you have to completely unplug the adapter for it to work if it's not plugged into the wall. I was not a fan of this monitor at all. It gets a lot of interference, from all kinds of things. It is constantly beeping at us, or worse, making a horrible screeching noise that won't go away until you turn both monitor and receiver off. It was one of the lower priced monitors and now I know why. We get a horrible beeping noise from this monitor whenever we put the receiver near the phone, remotes, lamp, almost anything! Even the ceiling fan seems to make this monitor go haywire. I do like the fact that I can set the monitor on voice only so that I don't have to hear the air conditioning or fan when they are running and the price was great but the interference we have experienced with this monitor is the pits! My daughter isn't a child or infant. She is 21 years old with multiple handicaps and medical issue. Recently a tornado took our home and we found ourselves living in an apartment complex( we lived on a dairy farm). I use a baby monitor to monitor my daughter throughout the night. There are so many people in this complex with wifi etc. I tried several different monitors, only to return them due to static. I tried the Sony Baby call monitor, finally sucess. Not only is there no static , I can hear a change in her breathing patterns. We have 2 of these monitors for our twins. They work great! We set them on different channels, and there is NO interference. I love the "voice only" option so you don't have to listen to background noise or music in the room. I love this baby monitor, it is inexpensive & works like a dream. I bought mine when my twin boys were 2 months old & still use it in their room today & they are 2 1/2. Only monitor I ever used that lasted more than a couple months. Has several different channels ( I only ever needed to use one) and I even take it in the shower with me. Works great! For the most part, I would be lost without my baby monitor. It works, has a good range, and does what I need it to do. My only complaint is that occasionally it decides to go crazy and beep like I'm receiving a Morris Code. But, usually shutting it off and turning it back on stops that. So, if you can handle being beeped out once and awhile, it's a nice monitor for the price.